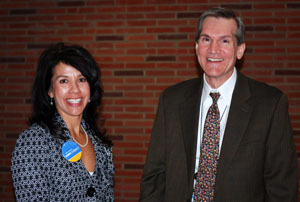 The CareConnect Advance forum, held April 14, encouraged health professionals within the UCLA Health System to take an active role in creating a successful electronic health record (EHR) program. The forum drew hundreds of leaders and innovators across our organization to support the future of UCLA's CareConnect Program. During the meeting, presenters from UCLA demonstrated how our EHR Program will enable leading-edge care, research, and education. In an overview of the CareConnect Program, Michael Steinberg, MD, Chair of the Executive Oversight Board (EOB) for the Electronic Health Record, talked about how it will help UCLA to keep moving forward as the innovative organization for which it is renowned. the EOB and Department Chairs. 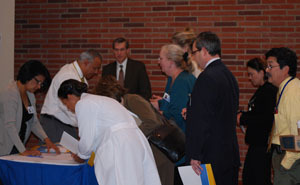 Hundreds of people within the UCLA Health System register at the CareConnect Advance forum. 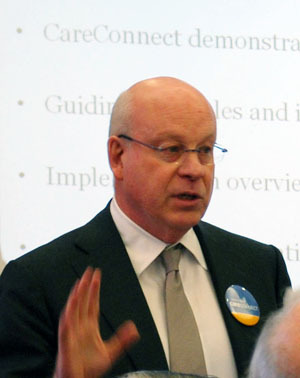 "CareConnect is going to be transformative to the UCLA Health System not only in the way we take care of patients but in how we educate our students and our residents, as well as having huge ramifications for our ability to do clinical research," said Dr. Steinberg, who is also Professor and Chair, Radiation Oncology. 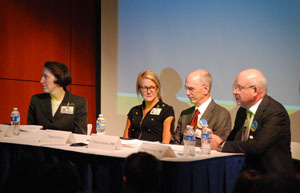 Several members of the Executive Oversight Board, including Virginia McFerran; Patricia Kapur, MD; A. Thomas Rosenthal, MD; and Michael Steinberg, MD, held a panel discussion in which they highlighted the important aspects of the 11 Guiding Principles developed for the CareConnect Program. They serve as touchstones to keep the program on track. The ultimate focus of these Guiding Principles is on improving patient care. Representatives from Epic (the software company providing the core technology in CareConnect) gave a demo of the system, showing the audience how to document and review results during a patient encounter, highlighting transitions of care in various care settings. They also demonstrated convenient tools such as "note writer" (to help expedite the physician's note-writing) and "navigator," a workflow tool. 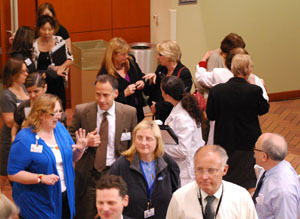 In a discussion about "Next Steps," Ellen Pollack, RN, highlighted upcoming events. These include Site Visits that are planned for the week of April 25 and Validation Sessions, scheduled for late May. Arpi Chalian, MD, Director of Organizational Transformation, addressed the ways UCLA Health System is embarking on this exciting change. She focused on how we can each do our part to be accountable for the success of CareConnect. In a video shown at the event, David Feinberg, MD, CEO and Vice Chancellor, RRUMC, focused on the potential of CareConnect: "What CareConnect does is it allows an integration that takes us to the next level. It will catapult us in patient satisfaction, patient safety, quality, efficacy, and efficiency; it really gives us strength and power that is as big and as powerful as one of our new hospitals." 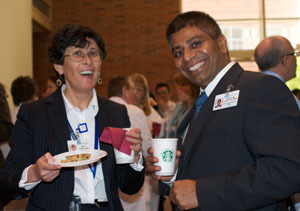 with Shadaab Kanwal, Clinical Informatics Director. Services, chat during the meeting.